Sleep is essential to all humans. Funny thing is, it seems like most humans struggle to get enough. As a college student, you’ve probably already discovered that getting this elusive thing called sleep is harder than you bargained for. There’s homework, social outings, and all that basic adulting you’re trying to accomplish. Who has time for sleep? And good sleep at that? Achieving a night of healthy sleep not only takes discipline, but it can take a bit of planning as well. It’s important to think through your schedule and what aspects of your life you’re willing to move around in order to make room for healthy sleep. 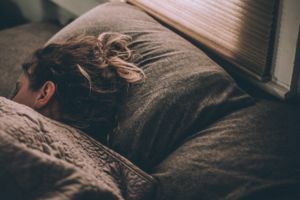 We’ve compiled a list of ideas for getting healthier sleep, and even if you’re already getting fairly good sleep, making a few of these tweaks can help you go from good to great. Going to bed earlier than you’re used to can be a bit difficult—the time can really get away from you if you’re not paying close attention! If going to bed an hour earlier than you’re used to seems daunting, consider making your bedtime earlier in small increments instead of taking such a big leap all at once. If 15 minutes seems too overwhelming, try moving it back five minutes at a time. Moving your bedtime involves a little planning as well. Time yourself, and see how long it takes you to get ready for bed—you might take a lot longer than you think! By figuring out the amount of time it takes you to brush your teeth and wash your face in the evening, you can then figure out when it’s the right time to start getting ready in the first place so you can get to bed at the time you want. Sure, you might still be able to fall asleep after having that 3:00 p.m. cup of coffee, but your sleep quality might not be that great. Not only that, but many people do have trouble sleeping after having caffeine late in the day. Do yourself a favor and cut back on the stimulants in the afternoon and evening—they’ll only give you that jittery feeling right alongside a bit of anxiety and a night full of wake-ups. Stress levels can be high in college—after all, you probably have a lot on your plate with schoolwork, your social life, a job, and planning for your future. It’s important to learn how to manage your stress in a healthy way, and getting a good nights sleep is one of those ways. In order to help yourself calm down and relax before bed, try setting aside 30 minutes to an hour simply for winding down. Spend some time with the Lord and journal, talk with your roommate, read a good book, or take a hot bath. Your routine deserves some intentionality because your emotional and mental health is really important. Your brain remembers routines. Having a specific evening routine can help your mind and body get into sleep mode. As you start your routine, your brain is alerted that it’s almost time to sleep and can start preparing to shut down and unplug. Your routine doesn’t have to be crazy structured, but try to avoid falling into bed with all your clothes on or falling asleep at your desk over your homework every night. Neither method will serve you well in the long run. Most blogs will suggest keeping electronics out of the bedroom altogether, but we know that probably isn’t realistic—especially for college students. Instead, we want to encourage you to use self-control and moderation in how you use your electronics before bed, particularly if you are having trouble falling or staying asleep. Sure, it’s okay to scroll on Instagram for 10 minutes before bed, but then after that, put your phone down and pick up that mystery novel you’ve been enjoying or get started on your journaling for the evening. The key is moderation and not going overboard with that blue light that does nothing good for your nighttime sleep.